Since the feeling of freedom washed over my husband and I, I have became an advocate for living smaller. It is not that you need to live small the rest of your life, but you should definitely try it at least once! Today, I am going to share with you a few reason to downsize your home in hopes that it will open your mind to the possibility of trying something new. For many, this is a chance to look at what you own and identify why you have it. Is it something you use all of the time, some of the time, or just wishful thinking? Realizing that you have limited space seems to make it easier to identify why you have something. The “just in case” and “one day” items will be put to the test to see if you will do something now or not at all. While cleaning is something that is a never ending cycle, living in a small home will reduce the time you spend doing it. This means less time cleaning the kitchen, scrubbing the bathroom, mopping/vacuuming floors, dusting, etc. It also means that you have more time to start a new hobby, going on new adventures, and/or more time for self-care. This was the best benefit for me personally. You never realize the toll things take on your mind and body until they are no longer present. Take a moment to think of an area that you dread looking at or dealing with at all. That agonizing feeling is what I felt for such a long time. By having a smaller home, it is hard to have a space that clutters your mind. Not to say that you will not every have a space like this again, but it does not feel like the same. The pressure to tidy it up is minimal compared to before downsizing. The dread of dealing with cluttered spaces or cleaning all day is reduced, which means your are able to transform what you think about. Instead of thinking about what all you have to clean or tidy up in your home, you can think about what activities you are going to partake in for the day. You get to choose to think positively and look forward to doing what makes you happy, which is a lot easier when less is weighing you down constantly. You never realize how much you can take, until you challenge yourself. As I said earlier, I did not want to downsize. By doing it anyways, I have tested my ability to live with less, mental strength, and creativity. While these tests were not easy, they taught me a lot about what I could endure, which is actually a lot more than I thought. I never knew how creative I was until I downsized. The fear of trying new things no longer exists due to this experience. What can you test about yourself? 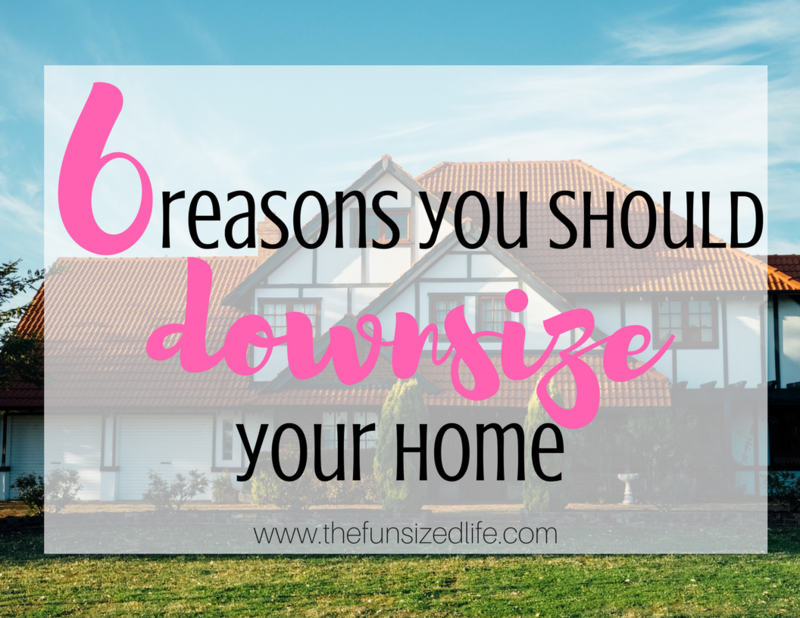 What will you learn from downsizing? How will you ever know, unless you try? You cannot imagine how much your life will change by downsizing your home. The way you think about space transforms completely. Suddenly you see creative ways to organize things, increase in the quality of your relationship(s), and much more. The idea of increasing your home’s size one day may give you the fear that downsizing your home once did. You may also decide to live smaller for the rest of your days, which is amazing! Of course when you downsize your home, you save money! The electric, gas, and possibly the water bill all decrease due to not needing so much to heat, cool, or wash. Now, decreasing your home by half does not necessarily mean your bills will decrease by that much, but anything counts right? Our electric bill decreased by roughly $25-50/month, which is amazing! However, we do have a water bill now; whereas before, we had a well (which is free, besides maintenance). So you may save with one, and add a bill for another reason. Just something to consider. Overall, we do save money with our utility bills. Another way to save is by reducing your cable costs. Before downsizing, we had satellite TV, and switched to Netflix after we moved. Due to the decreased time spent inside our home, we decided that Netflix is all we really need. This switch is saving us over $75 per month! The last way we are saving is by having a reduced mortgage payment. The land we purchased was at a much lower price than our previous mortgage, so our monthly payment reduced, as well as real estate taxes!! I will not go into specifics on how much we save overall with this switch, but it is substantial! If you are thinking about downsizing your home, I hope the information I shared with you helps you decide to just go for it! Downsizing is something everyone should try at least once. Having a fresh perspective on life through living small is something that can transform your life for the better! Living small, removing the excess from your life, and getting your mental health in check are all things I love to share. Thank you, Renee, for the opportunity to share with your community! Hi! I am Erin, owner of A Welder’s Wife, a wife, fur baby momma, small farmer, and kombucha obsessed! I love sharing how simple living can change your life by getting back to the basics, removing the excess, and focusing on what is most important. You can follow me on Instagram, Pinterest, and join my Facebook Group! Thank you for allowing me to write this for your community, Renee! It was such a treat to share a bit of my journey in the hopes of inspiring your community to downsize their homes, too! Absolutely! I’m so glad you were able to share your story!